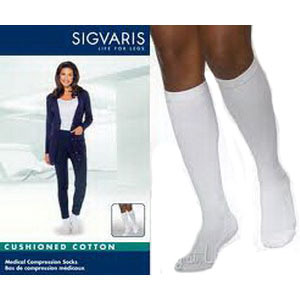 Sigvaris Inc Cushioned Cotton Women's Knee High Compression Socks these one of a kind women's circulation hose are specifically crafted for those with chronic venous insufficiency and moderate to severe leg swelling. Their cushioned cotton design helps absorb the impact of walking or running, and they're perfect for those with sensitive skin, as well. Soft, cushioned sole, heel, and toe protects feet and helps absorb impact from walking or running.